To use xenophobia for system change is unacceptable. "The established political class was totally anti-Brexit and totally in favour of staying in the EU" - do you think they were in the interest of the common citizens? "Whistleblowers that blow the whistle on corruption in government and war crimes are not traitors!" - How much do you agree? Does whistleblowing contribute to a better Europa / better World? Does the video inspire new thoughts or actions? 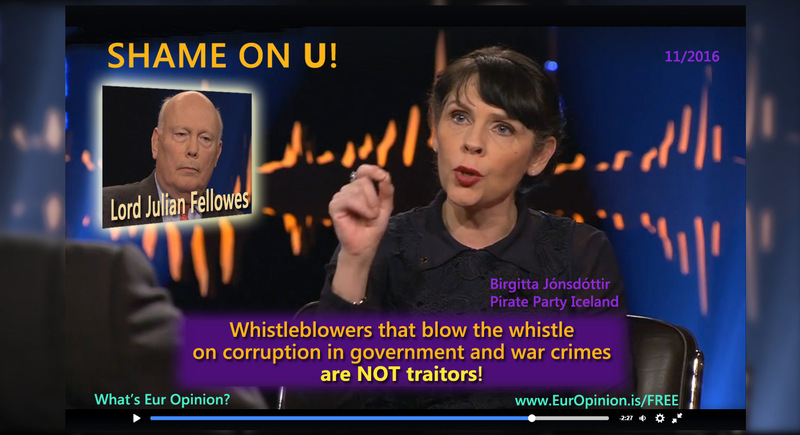 Birgitta Jonsdottir​ (Pirate Party Iceland, IMMI, Wikileaks) rebukes Lord Julian Fellowes (English actor, novelist, film director) on whistleblowing, during a debate about the US elections and Brexit by the Swedish/Norwegian Skavlan talk show. but before that we will go to Iceland. the prime minister and the government must resign. with other left wing parties. up from 3 in the last election. Hi, nice to see U again. - Welcome to the program. so we need to speak in English, if that's ok.
- Let's stick to english. in the house of lords do U think? I would rather fit in the house of commons. I come from a very common background. i'm a "poetician", not a politician. posh lot anymore, that's gone. i guess i'm never gonna be a Lord... or a Lady. in the Icelandic election, two weeks ago. about becoming the prime minister? where i describe this nightmare. to acquire power or become power, rather. I haven't been an activist all my life. U call Robin Hood politics. to facilitate that voice into the parliament. like Robin Hood was a pirate. had stolen it from the people. So that's what U wanna do? - Hold on to Ur castle now. which has gone on for so long. and also a lot around the Brexit campaign. And i find that to be unacceptable. - I wouldn't put too much onto that. because she's not originally from the UK. some members of UKIP did as well in the UK. - I follow these things very closely. - U're right, i wouldn't disagree with that. the same or similar discontent? - Choose! Yes or no. are between 18 and 29.
to find a home in politics. i think most of this comes out of fear. trying to live their lives. that immigration was the big issue. - But aren't U then stuck in Ur bubble? exactly the opposite of what you say. For U and for America and for England. No! I'll tell you what is the main issue. then that is a problem. to what was done behind Brexit. and totally in favour of staying in the EU. of the established political class? i suppose, of the political class. on minimum wage? Have U ever? but the difference is, i know i don't know. the ends not meet at the end of the month. if the tire brakes down. Because they have to choose. so i'm not going to take U on. I think that's completely right. to what life IS, for an enormous number of people. And they are not alert to it at the moment. I know. We agree on that. are talking about this week. - Well I have not played a part with Wikileaks. because U left Wikileaks some time ago. for a while U were a spokes person also. in effect helping Donald Trump to victory? Maybe, many people say that anyway. I think that they went to far. - // I can't let this go on, i'm sorry. It was the act of a real traitor. // I never said that! - No i never said that. then U can disagree with that. - // I disagree with that, profoundly! or about the US election? Oh, nononono... Wikleaks, per se. Well, we disagree on that. is the Panama Papers, for example. Are U in disagreement with that? that took ten months to make sense of. we would not see this type of work. - that's about my main contribution to that. Do U have that view on Panama Papers as well? That that should never have happened? -// Well, forget that theory. U have that view on Panama Papers? seems to be coming out of it. and i'm sorry if U don't approve of that. Would U consider him a friend? to have communications for a long time. of how the elections went in the US. in the head of Julian Assange. - You have to ask him. - But since he's not here. and i can't really go deeper into that. - Well U have one artist in politics here. here tonight and thank U Julian.